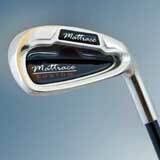 The Mattiace Black Irons have offset hosels to promote a draw of the ball. These stylish irons have extra weight on the bottom of the club to add height and distance. Also a deep undercut cavity makes the sweet spot greater and more forgiving on off center hits. To replace your 2, 3, and 4 irons, these custom pro-line hybrids give you extra carry and height - they are easy to hit and are available in 18, 21, and 24 degree lofts. Replace one iron or the entire set. 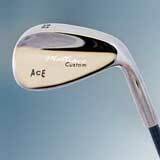 They are forgiving, easy to hit, and give much more distance than the equivalent iron. Lighter head is especially designed for women. Replace one iron or the entire set. They are very forgiving and easy to hit. Wedges are the "scoring clubs" in your bag. 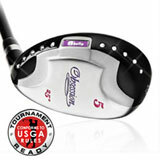 Our wedges feature pro-line groove technology, low center-of-gravity, and optimal bounce. 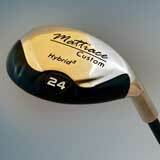 We will fit your wedges to your swing to make those Flop Shots, Bump and Runs, and Sand Saves easier. Putter choice is very individual, so we carry a wide range of pro-line putters and putter grips.